THE LEADING FRENCH BRAND THAT'S PIONEERING ANTI-AGEING ALKALINE CELLULARE REGENERATION. LACURE OFFICINE is the anti-ageing cosmetic innovation, that helps correct the signs of ageing, prolong youth and contribute to well-being by offering spectacular scientifically advanced beauty and rejuvenation treatments, combined with a brand new integrative approach. An exclusive and unique complex, with exceptional properties for the skin: regenerating, repairing, nourishing, protective and anti-ageing. Obtained thanks to Plant Biotechnology, an exclusive technology created by LACURE OFFICINE, which concentrates the most powerful antioxidant alkaline active plant ingredients to regenerate and soothe the skin. The history of LACURE OFFICINE is quite similar to the history of science today: a science focused on human nature that uses a unique transversal approach while being inspired by the most innovative scientific concepts. It was in 2006, right in the heart of Paris, in Saint-Germain-des-Prés, that everything began: Héléna Compper and two scientists met with the goal of using alkaline nutrients to produce active ingredients in order to preserve youth for longer. During her research, Héléna Compper, assisted by Dr Hervé Grosgogeat and numerous researchers at the international acid-base symposium in Munich, discovered acid-base rebalancing, its anti-inflammatory action and its positive impact on ageing factors. This research gave rise to an anti-ageing nutritional method and an innovative concept, the scientific foundations of which have been the subject of several books on the preservation of youth (Editions Odile Jacob) and numerous international scientific publications. In 2010, she won acclaim from the press and numerous scientists for the creation of a scientific research team which began working on the acid-base balance and its applications to cosmetics. First, they selected medicinal plants, plant stem cells, rare and valuable ingredients, all plants with alkaline and antioxidant properties, in order to find exceptional formulas for their soothing, nutritive and restorative properties. In 2013, they discovered a new Cell Mesh technique (Quadricell Technology) capable of combining alkaline nutrients, super antioxidants, vitamins, minerals and essential fatty acids. The earliest research showed that the formulas acted both on stress factors and accelerated ageing, as well as on the skin. The idea of ​​a line of anti-ageing cosmetics, repairing with alkaline nutrients and super-antioxidants, was born. 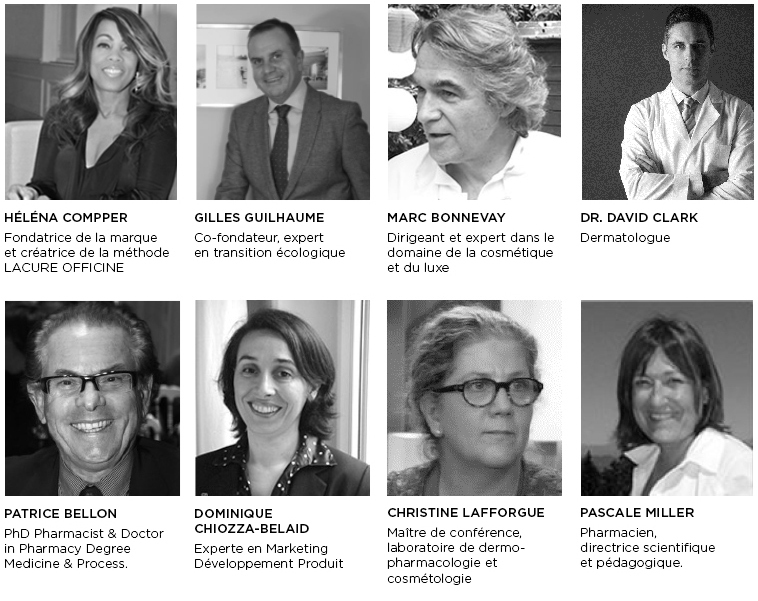 In 2016, after 10 years of collaborative research, LACURE OFFICINE, the leading French brand of anti-ageing cosmetics offering treatments to promote beauty and fight premature ageing, was able to offer the concept of "Natural Reverse Ageing Cosmetics". It deploys its global bio-systemic philosophy in the Saint Germain des Prés district, at the first institute of Treatments labelled Haute Apothicairie. For the first time, natural rejuvenation is based on a spectacular scientific advance: the power of super-antioxidant alkaline nutrients when combined with cellular activators. the positive impact of alkalinity on each of the cells in our body. The key to the success of LACURE OFFICINE treatments is the principle of alkaline cellular activation, discovered by the two-times Nobel Prize winner, Dr. Otto Warburg, along with the numerous scientific researches and publications on alkaline cell regeneration and its effect on silent inflammation. Alkaline nutrients have long been recognised by the scientific community for their antioxidant properties and their extraordinary benefits for health, vitality, longevity and rejuvenation. THE INNOVATIVE ACTIVE INGREDIENTS STEM FROM BIOTECHNOLOGY. This multi-performance natural science, based on Super-Antioxidant alkaline nutrients, offers infinite potential. It guarantees pure new active ingredients with constant quality, which the body can assimilate immediately. Along with many other distilled nutrients, in just the right dose, which work deep down to offer unequalled efficiency. "AGEING IS OUR DESTINY. AGEING WELL IS A CHOICE! " LACURE OFFICINE shares this conviction by supplying its customers with a complete range of exceptional treatments. Personalised lifestyle indications. A 21st century pharmacy which combines modern science with "haute apothicairerie". LACURE OFFICINE offers more than beauty treatments to repair and treat the skin. Our incredible creams, serums and cellular nutrients give extraordinary results. These are remarkable treatments with unprecedented benefits for an exceptional dual regenerating and perfecting action. An overall improvement in all the visible signs of ageing is now possible. For LACURE OFFICINE a de-acidified and soothed body stays young for longer.